This article first appeared in The Edge Financial Daily, on March 19, 2018. KUALA LUMPUR: The Malaysian medical tourism industry’s revenue broke through the RM1 billion mark for the first time in 2016. By 2020, the national target is to double that. It may seem ambitious, but the Malaysian Healthcare Travel Council (MHTC) is confident of achieving that figure. The market in its sights? China. After China scrapped its one-child policy in October 2015, the council estimates there are around 90 million couples in China looking to conceive a second child. Out of these, 40 million are over 40 years of age, it added. Capturing a mere 1% of that market could boost the local medical travel sector considerably — healthcare travel arrivals to Malaysia was just below one million in 2016. MHTC chief executive officer Sherene Azli said that market size presents opportunities for assisted reproductive technology where Malaysia has a competitive edge. “For example, our in vitro fertilisation (IVF) treatment success rate is actually among the highest in the world at about 66% compared with the world average of 50%,” she told The Edge Financial Daily in an interview. Healthcare tourists from China are already Malaysia’s second-fastest growing market in 2016, according to MHTC. That year, arrivals from China grew 20% year-on-year (y-o-y), behind Vietnam at 83% y-o-y. 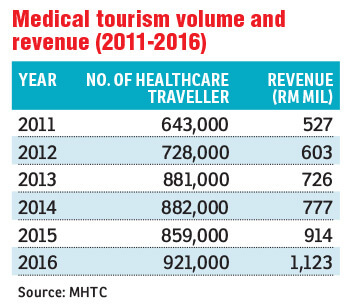 In turn, these rapidly growing segments are slowly reducing Malaysia’s historical reliance on Indonesian medical travellers, who make up about 60% of the volume in the past. MHTC declined to provide a breakdown of medical tourist proportion and average spend per head by country of origin. Its data excludes numbers from dental and wellness treatments. It said fertility and cardiology treatments are among the top five treatments sought after by healthcare travellers to Malaysia, alongside orthopaedics, oncology and aesthetics. In 2016, Malaysia welcomed 921,000 healthcare travellers, which generated RM1.123 billion in revenue. The medical tourism sector has sustained a compounded annual growth rate (CAGR) of 15% between 2011 and 2016. MHTC aims to rev up the CAGR higher to 20% between now and 2020. It estimates that for every ringgit spent by medical tourists, the multiplier effect for the larger tourism sector is between RM3 and RM4 across transportation, accommodation and food, among others. In 2016, the overall tourism industry — consistently among the nation’s top foreign exchange earner — made up 14.8% or RM182.4 billion of the national economy, up 9.4% y-o-y, according to the Department of Statistics, Malaysia. From that figure, RM81.2 billion was due to inbound tourists, rising 8.7% y-o-y. Malaysia welcomed 26.8 million inbound tourists in 2016, predominantly from Singapore, Indonesia and China — translating to an average spend per tourist of RM3,029.85. As at 2016, the overall tourism sector accounted for 22.7% of total employment with 3.2 million people employed, two-thirds of which were in retail trade and food and beverage serving industries. For medical tourism, there is plenty of room for growth. In 2016, the estimated revenue per medical tourist was just under RM1,300. In comparison, Sherene said IVF treatments can cost up to RM14,000 per patient. Cardiology treatments also typically involved higher-value procedures. MHTC expects medical tourism revenues to continue to increase this year. It is slated to release its latest data by April. Zooming in on China is a potentially high-reward strategy that also calls for considerable investment. Sherene is of the view that pushing further into the Chinese market will take up a fifth of MHTC’s budget this year due to its market size and unique social media platforms that require additional investment. To support MHTC’s agenda, the government had last October set aside RM30 million in Budget 2018 to position Malaysia as a regional fertility and cardiology hub. The government also announced the e-visa online application system for medical travellers for 10 countries including China, Bangladesh, Myanmar and India. In a nutshell, an e-visa allows the holder to stay up to 30 days depending on type and nationality. It is valid for three months, according to the Immigration Department’s website. It would ease entry for many medical tourists, said Sherene. For perspective, some regional competitors in the medical travel space have relaxed visa rules, which give them a competitive advantage. For example, Thailand — the leading medical tourism player in the region by revenue market share — allows visa-on-arrival for 19 countries including China and India. A 2016 study by Frost & Sullivan showed that up to 2015, Thailand remained the dominant player in the Asia-Pacific, with around 50% of the regional market share for medical tourism compared with Malaysia’s share of 3%. “So the e-Visa medical is very critical for countries that are big opportunities for us. Without the e-Visa, it’s very hard for them to get an extension, for example, and that’s when they run to other countries that don’t charge, impose visa,” said Sherene. Apart from visa requirements, another hurdle Malaysia faces in growing its medical tourism revenue is that Malaysian healthcare cost is still cheaper for foreigners compared with other countries, said MHTC. While foreign patients pay the same medical costs at Malaysian hospitals as locals, MHTC noted that in South Korea, foreigners often pay thrice as much as locals. “For Malaysia, we only came out of our shell in 2011. So rather than playing catch-up, what we do now is to try to carve out our own niche (in fertility and cardiology),” said Sherene. An initiative MHTC embarked on is the flagship hospital programme that seeks to brand Malaysia as a medical tourism destination. It is now shortlisting candidates from its pool of 19 elite hospitals, who are aggressively investing into medical tourism. The objective is to have a core group of hospitals known internationally for stellar quality of service and collaboration with other top-notch institution, said MHTC. The council said the chosen flagship hospitals will be required to invest in their own branding, as well as research and development, among others. In return, the flagship hospitals will receive a number of incentives to be announced down the road, it adds. The point is to have stand-out hospital names that pop into people’s minds when thinking about Malaysia as a medical tourism destination. “When people go to Singapore (to seek medical attention), they will immediately think about Mount Elizabeth or Gleneagles (hospitals),” said Sherene. “We are aiming for not more than five (flagship hospitals),” she said, adding that the first flagship hospital will likely be announced in the second half of 2018.